Naples is the throbbing heart of Southwest Florida's idyllic Paradise Coast. The booming Naples real estate market is the result of a mild climate and the comfortable, active lifestyle that such good weather promises. This small, beachy city inspires visitors with its picture-perfect views of both the Gulf of Mexico and the untamed wilderness of the Everglades. Naples homes for sale are designed to attract casual vacationers and permanent residents alike, whatever their needs. As one of the wealthiest regions in the US, it shouldn't be surprising that you'll find awe-inspiring luxury estates that are almost like waterfront palaces. Even on a budget, though, you'll also discover plenty of affordable options that are no less designed to help you relax and enjoy Southwest Florida's best. Whether you're looking for a one-bedroom condo or a six-acre estate, you'll find it in sunny Naples. There's much more to learn about life in Naples, or start browsing our comprehensive Naples real estate listings immediately, including vacation homes and Naples condos for sale. Key Real Estate offers comprehensive and up-to-date Fort Myers, Naples, Estero, and Bonita Springs real estate listings. Register with us today to gain full access to our suite of search features. Naples condos for sale provide affordable access to everything that this beachy town has to offer, as do many of the manufactured homes in the region. Though short on square footage, these smaller homes typically provide full bathrooms, shaded porches, and washers and dryers at mortgages lower than you'd typically pay to rent a similar space. Vacationers, and even full-time residents, enjoy life out of doors, and so the great appeal of these cottages and condos is that they're frequently located within walking distance of a variety of outdoor fitness activities, like swimming pools, shuffleboard courts, and golf clubs. If you plan to spend more time on the fairway or the beach than on the couch, these are a smart buy. On the other hand, Naples is home to some of the most opulent real estate in the United States today, with large homes routinely selling in excess of $40 million. If you're trying to find a distinctive architectural masterpiece of your own, you'll find many carefully constructed custom estates stretching across acres of Naples waterfront. The finest of these homes offer a park-like atmosphere behind gated entry, where you'll find guest houses, swimming pools, and ample garages in which to store your collection of fine automobiles. Naples is a great place for work or play. Many Naples homes and luxury condos are located in exclusive communities that provide unlimited access to the kinds of amenities you'd expect from a resort hotel. At Longshore Lake, for example, residents enjoy access to Har-true tennis courts, a club house, an updated fitness center, and heated swimming pools. In Heritage Bay, people get to live close to natural quarry lakes and preserved land teeming with wild life, while also being able to play 27 holes of golf on an exclusive course. Depending on your imagined lifestyle, chances are that you'll find a community that's made for you here. You'll definitely want to visit our exclusive community guides to find out more about life in this part of Southwest Florida. Naples homes for sale also take advantage of a great location on the Gulf Coast. The area is served by Interstate 75 and U.S. Route 41, routes you can take north to Fort Myers or eastward, through the state parks of the Everglades, to Fort Lauderdale. Naples supports a large population, so it's anything but a tourist trap. Many of the city's award-winning restaurants are beloved by locals and visitors alike, and weekly farmer's markets in Naples and North Naples celebrate locally made products. There's an impressive amount of art and culture in the community as well, including many local art galleries and the Philharmonic Center for the Arts. 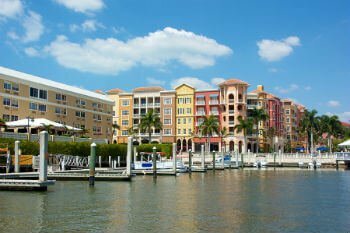 So whether you see yourself in a Naples vacation home for sale or plan on living in Southwest Florida year round, you'll find this small city to be a community-minded place. Contact Key Real Estate now to learn about how you can buy or sell Naples real estate. We offer friendly, world-class service, whatever your needs.